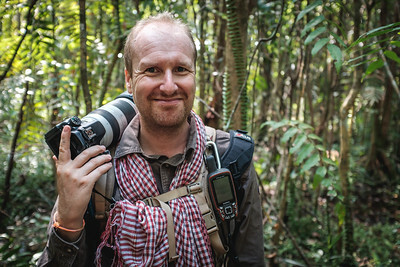 Stéphane De Greef is a Belgium-born environmental engineer, cartographer, photographer and science communicator who has spent the last two decades working on a wide range of projects around the world, with a focus on tropical ecosystems and developing countries. You might have bumped into him mapping minefields in Cambodia, Laos, Nepal, India, South Sudan or Western Sahara; exploring and mapping remote jungles in Ecuador, Gabon, Cambodia and Panama; teaching cartography in Haiti, Burkina, Mali, Senegal and Benin; developing ecotourism and running tours around the temples of Angkor and the jungles of Panama; promoting the rights of women, children and people with disabilities in Southeast Asia; discovering and exploring a lost city in the jungles of Cambodia, and photographing, documenting and studying bugs all over the world! In 2012, his knowledge of cartography, landmines, and forests played a key role in the mapping and exploration of the ancient royal capital of Mahendraparvata, the cradle of the Khmer Empire. Equipped with a machete, GPS and maps he designed using airborne laser technology, he spent months looking for evidence of an ancient civilisation, finding dozens of millennium-old temples swallowed by the jungle. When asked what his job is, he'll usually start with "it's complicated..." and proceed with a combination of data management, environmental studies, cartography, field biology, photography, ecotourism and science communication. He usually runs several projects at the same time, preferably from somewhere wild and remote, and spends an unhealthy amount of time prowling highly addictive digital superorganisms known as social networks, namely Facebook, Twitter and Instagram. A nature lover from his earliest days, he's currently steering away from his humanitarian and archaeological career and refocusing on advocating for the smaller majority (i.e. the insects and other arthropods making up 90% of the animals species on Earth) and promoting conservation, the biggest challenge Humanity is facing in the Twenty-first Century.